We were introduced to North Atlanta when the church was preparing to establish a new service with instrumental worship in a secondary space. They wanted to create a more intentional environment that utilized technology more than they ever had in the past. This room would establish the baseline for future upgrades and renovations in the main worship center. After working through the values guiding the introduction of modern technology into the church's worship culture, we realized that audio was the first priority. The space was cavernous acoustically with a very old system, and they wanted a room encouraging participation. The aesthetics of the room were a close second, where intentional lighting and the use of color would be key in making the room feel fresh and new. While the church wanted a system that encouraged participation, it was equally important that it not cause distractions. After carefully choosing a L’Acoustics PA, we had an acoustic treatment package from Perdue Acoustics balance the natural decay between high and low frequencies, tighten up the low end response of the room, reduce flutter echoes, and make speech sound more direct and natural. This project had a firm completion date requirement in order to be ready for an Easter public launch of the new environment. To ensure our deploy interfaced efficiently with their teams and the project was executed cohesively, we coordinated with the architect and construction project manager that we had introduced to the church. Following new paint and a small amount of electrical work, we hit the ground running and finished on time. A core value for the specification of the production systems was high quality tools to maximize longevity of the investment, and ensure as “maintenance free” of a system as possible. 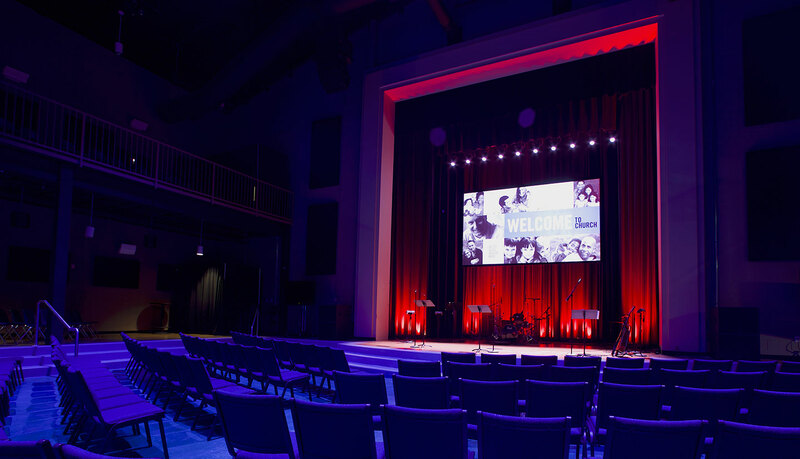 The audio, lighting, and presentation systems are all capable of connection to the Guardian by Mankin network operation center for real-time remote support of the church’s staff and volunteers. The audio system is based around a L’Acoustics ARCS WiFo loudspeaker system with flown single 15″ subs as extensions of the main arrays, and two SB18i single 18″ subwoofers on the ground at either side of the stage. Additional 8XT fill speakers are utilized for under balcony fill. This PA fit the room like a glove, and raised the bar for all of their other environments the moment it was first turned on. A Midas audio console with Shure wireless mics and in-ears, as well as a new mic package comprised of Sennheiser, Shure, Radial, and Atlas gear, ensures the inputs are translated to the room transparently. The theatrical lighting system is 100% LED, utilizing a mixture of Chauvet Rogue R2 and R1 wash fixtures for stage, key, fill, and house lighting, along with Chauvet Batten fixtures for curtain wash. All of the primary fixtures in the room are pan/tilt/zoom, which provided tremendous flexibility, allowing a smaller fixture count to accomplish more. Every fixture in the rig also has full RGBW color mixing, which allows the entire room to be painted in color at the touch of a button. A Jands Vista console is utilized to operate the entire system. The video system is comprised of a Digital Projection 12,000 lumen DLP projector fed from a dedicated ProPresenter graphics workstation. We also supplied a high definition stand alone camera, so the church could capture their service for upload to the Internet. It was really important to the church to do it right the first time by utilizing high quality equipment that would have maximum return on investment. Through collaboration and our mutual commitment to sustainable excellence, we were able to do just that. One of the unforeseen highlights of this project is that they connected the camera we supplied to a computer, and now broadcast their service every week through Facebook Live. They simply use the stereo microphone on the front of the camera – located at FOH – to pick up the sound for the broadcast, and it translates wonderfully. A testimony to how great this room sounds.